Mimi Flys: Do you want a Poke? Do you want a Poke? New layout, new look and a new series here on Mimi Flys! I always used the tag line 'living in the city, working in the sky' for my blog - and although i've posted about the sky part fairly often I do feel like i've neglected my city somewhat. London - oh, what a wonderful city it is. So to kick the relaunch off I thought id start an out-and-about series all about lovely little London lunch spots. Il try to keep my ear to the ground and go to some of the loveliest places (oh, what a hardship!) and report back. First up, somewhere I had a rather delicious lunch yesterday. Ahi Poke on Percy Street. Your going to LOVE it. Ive been a huge fan of Poke of years, having L.A as your second home does that to you. 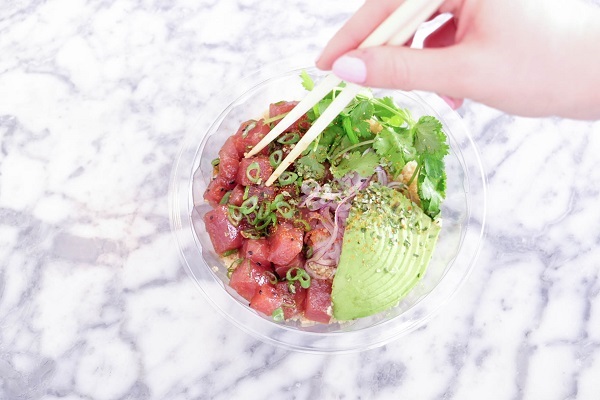 Poke is such a popular lunch choice over there - its as common to see a Poke bar in L.A as a sushi bar is here in London. Its one of those weird things that once tried, you develop a taste for that wakes you in the middle of the night. 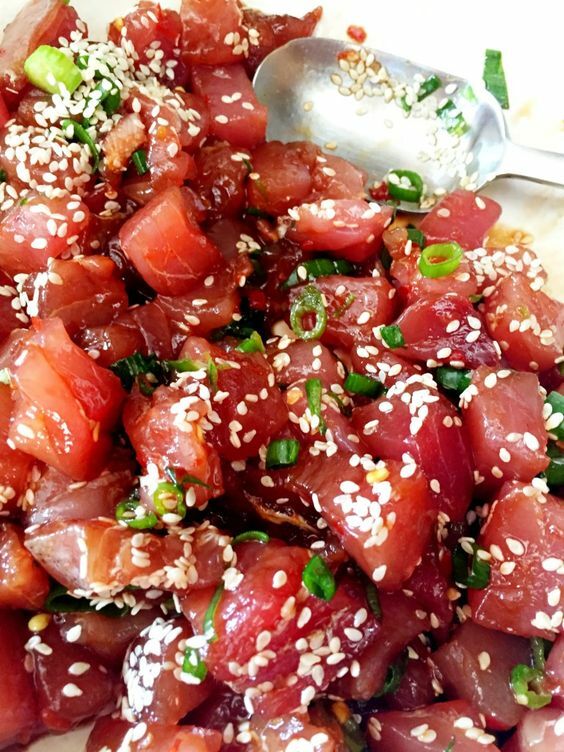 A craving that only a Poke fix will resolve. If your wondering what Poke is (pronounced POKE-EH and meaning 'cut into peices'), its a colourful and flavourful Hawiian dish. You start with a bowl, traditionally with a layer of rice (although this particular establishment offers a base of Quinoa or kale instead, if your feeling virtuous). Then you move down the chain and add a variety of toppings for texture and crunch. Popular toppings include mushrooms, avocado and sesame - but the list goes on. You then finish it all off with a dressing of your choice, before somebody expertly mixes it all together and hands you some chopsticks. 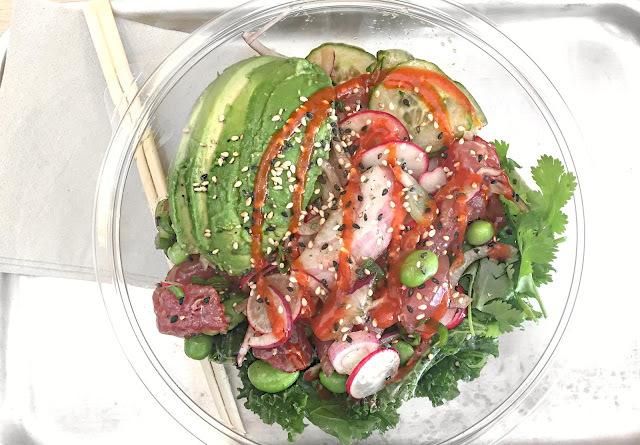 What do I think of Ahi Poke compared to the usual places i visit in L.A? Im well and truly impressed, and it certainly satisfied a poke hole id been harbouring since my last trip. I think the portion sizes were huge, I actually had to stop the guy from scooping more quinoa into my bowl, which is unusual to see - No rations here. I also couldn't finish my bowl, again, unusual to see! Price wise, compared to L.A the Poke here is expensive - but compared to the average take-out lunch in London its kind of the norm. Also, I feel that the price was justified due to the sheer volume of food and the generous helping of fresh tuna. Taste wise, absolutely amazing. The tuna was melt-in-your-mouth delicious, the sauce was sweet yet salty and everything meshed together beautifully. The only suggestion I'd make is that there be a wider range of toppings available - The usual Seaweed/Nori was missing as was tempura chips, both which would have added a nice crunch. So all in all, Ahi Poke is now firmly on my radar and I can get my fix without the 11 hour plane ride. SO, Have you been poked yet?